One of Newport's most loved buildings, the Lyceum Theatre, was shut in 1961 and amazingly knocked down to make way for the featureless, Eastern bloc style ABC cinema (opened in 1967). The Lyceum had a proud history of providing popular entertainment to the masses and it is a shame our City does not boast today a 1000 plus seat grand theatre capable of hosting high quality musicals and popular entertainers to set alongside the admirable Riverfront and doughty Dolman. The Lyceum Theatre on Bridge Street was built in 1896 on the site of the former Victoria Hall, later the Victoria Theatre, which had opened 20 years earlier in 1876 and was built for Henry Pearce Bolt, the Mayor of Newport. The Corinthian columns of the Victoria Assembly Rooms and Theatre were vast and grand. Over the stage were the words, ‘Our true intent is all for your delight’. It comprised not only a theatre but swimming baths including a Turkish bath, reading rooms and an assembly hall. It boasted fine acoustics. 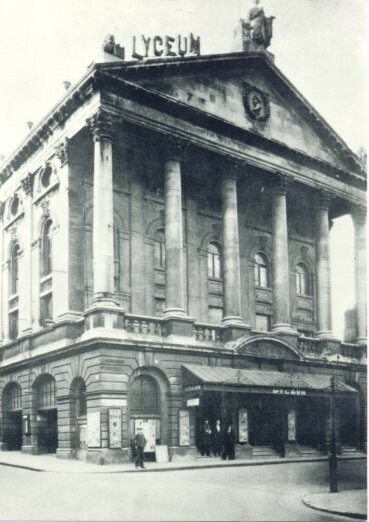 But the theatre was destroyed by a fire on 28th May 1896 after the audience had gone home after seeing a production of John Wainwright's Company in 'It's Never Too Late.' The Company lost their scenery and effects in the fire. The Argus reported "Probably the greatest fire ever witnessed in Newport occurred early this morning. Shortly before 1 a.m. an alarm of fire was raised and immediately a constable dashed off to the police-office and communicated to the fire brigade the news that the Victoria Theatre was ablaze. The brigade was promptly on the spot under the direction of Captain Horace Lyne and Lieutenant E. Coulman with the hose-carts, fire escapes, and the steamer and manual engines. In a short time the men were directing the water towards the flames. At this period the whole roof was ablaze - for the fire, which had apparently started at the stage, travelled from end to end of the building, before igniting the roof. So low was the pressure of water that not a jet could be thrust to half the height of the building. It is pretty certain that nothing could have saved the theatre, even if the pressure from the mains had been of the fullest." It was found that the walls and columns of the old building had not been weakened by the fire, and that they might therefore be used in the construction of the new building. Accommodating 1250 people the new theatre was designed by W.R. Sprague and the work carried out by John Linton of Newport. 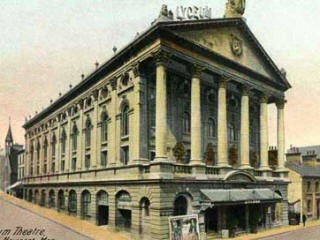 The building was renamed the Lyceum. In its 65 years it provided a wide array of entertainment to Newportonians. Musicals, dramas, ballet and circuses even eventually ice shows were familiar fare. One manager recalls an elephant too big to fit on stage that had to be paraded in the street between shows. Houdini amazed audiences in towns and cities across the country and performed here April 17-22 1905 . The magician's appearances in Newport were notable for his clashes with the authorities. He instigated court proceedings claiming to be the victim of an assault. Boxing featured regularly in the 1920's the brilliant Johnny Basham beat Phineas Emmanuel here in a bout in 1925. The newly formed society Newport Operatic Society opened at the Lyceum Theatre on 12th December 1921. They performed The Mikado. Seat prices ranged from 9d ( less than 4p ) in the ‘gods’ to 4s 9d ( about 24p) for the stalls and dress circle, played to capacity audiences. The Society continued annually at the Lyceum with a few exceptions. After the War they were back with The Desert Song. According to their website "The resumption was obviously eagerly awaited as queues stretched all around the Lyceum waiting for the opening of the Box Office for advance bookings and the show was a sell out in a matter of hours. 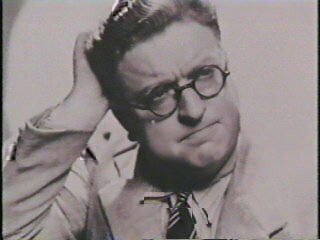 At the head of the queue was The Red Shadow, Mr Frank Davey, who bought 300 tickets." The society’s last show at the Lyceum was Rose Marie in 1960. The last pantomime and the last performance at the Lyceum starred Sandy Powell (right) as the Dame in a production of Little Miss Muffett. It finished on February 18 1961.